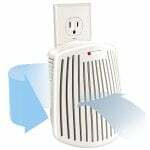 The Hamilton Beach TrueAir Pet Air Purifier Tower offers complete air protection for pet owners with odor elimination and pet dander filtration technology. 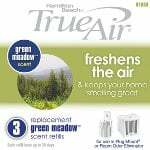 Featuring proven zeolite technology for eliminating unpleasant pet odors, this TrueAir Mini Tower Pet Air Purifier can be used vertically or horizontally. This air cleaning system includes 2 carbon/zeolite odor eliminating filters, 1 pre-filter and 1 HEPA-grade filter. The HEPA filter is a permanent filter that reduces pollen, mildew, mold spores and other airborne allergens up to 99%. 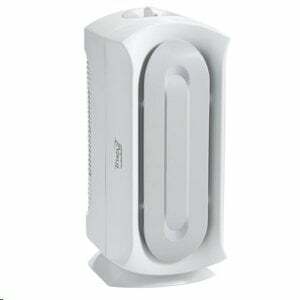 Coverage for the Hamilton Beach TrueAir HEPA Air Purifier effectively performs in rooms up to 140 square feet. 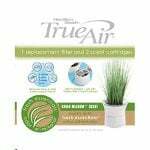 This TrueAir Pet Air Purifier features 3 speeds and comes in white with a plastic finish. The permanent HEPA filter will save you up to $49 per year compared to a comparable replacement filter. This Pet Air Purifier comes with a 1 year warranty and is UL listed.